Bimthang Manaslu Trek – An off the beaten trail Annapurna Circuit Part one. Bimthang situated in Manaslu trek route; explore magnificent trek beyond round Annapurna Trek in the peaceful environment which offers you unique experience with diverse savor. Gifted by nature, trekkers can feel the real nature pleasure in the trek non disturbed excess crowd. It was a junction point for Nepal – Tibet salt trade few decades back. Visit to Bimthang and Ponker Lake is life time memory which will leave you spellbound. Your heart will remain cool throughout the trek by stunning view of mountains like Mount Manaslu, Mt Kangaru, Himlung, Cheo Himal, Lamjung Himal, Phungi Himal and Ponker Mountain etc. Close observation of Himlung glacier, Himlung Lake, Ponker Lake and adoring people, pleasant accommodation, amazing flora and fauna. The Bimthang trek route first follows Annapurna Circuit part one then trek diverts to the right goes through the beautiful historical and cultural village of Tilche. Pyakane cave is another attraction located 30 minutes west from Tilche having religious significant. And we can visit Tamrang Gompa which is situated in north east Thonche village from Thonche village in 1 hour distance. Statue of Buddha and other deities, religious scriptures and holy book are positioned. 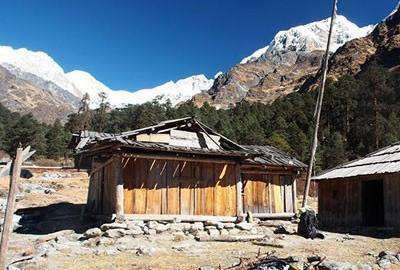 This off the beater trek in Annapurna can be combined with Annapurna Circuit, Nar Phu Valley Trek and people doing Manaslu Circuit end their trek in Annapurna Circuit Part one so Bimthag trek is ending part of Manaslu trek. Day 04: Trek to Dharapani (1963m), Overnight in Lodge. Day 10: Trek to Chyamje, Overnight in Lodge. Day 12: Fly back home or further destination. Day 04 :Trek to Dharapani (1963m), Overnight in Lodge. Day 10 :Trek to Chyamje, Overnight in Lodge. Day 12 :Fly back home or further destination. Guided Kathmandu Valley Tour in UNESCO World Heritage Sites with Private car/van. 1 Government registered, well experienced and friendly helpful guide. Assistant guide to support the group as per group size. Pokhara – Phedi transfer by private car or van depending on group size. My guide Pradip was an absolute star throughout the trek. We did the off the Annapurna main route to Bimthang which is part of Manaslu but doesn’t require Manaslu Trekking Permit. Everything went off without a hitch. I'm generally skeptical about guides as I find they bring their own agenda to the trip and seem to think that their brief is limited with less knowledge to showing the client the trail but Pradip has broad knowledge of trekking in Nepal and this at all and really added value to our trek and I would recommend anyone trekking in Nepal. Bimthang Manaslu Trek can be customized as per your requirements that suit your time and trip cost. The trip cost we offer USD 695 per person is standard price on double occupancy basis though it varies as per group size, season, mode of tour and length trek.